Last week, I visited Venice with my family for 5 days. I had never been, and it was an absolutely amazing experience, and somewhere I think everyone should go at least once in their lives. I knew I wanted to do a post about Venice, so to give it some structure, I thought I would do a '5 Things To Do In Venice', including some obvious choices, along with some lesser known discoveries that are well worth a visit. The above pictures is the view along the famous Grand Canal (the main canal in Venice) from the equally famous Rialto Bridge. Both of these are an obviously a must for your Venice trip. 1. Watch (or ride) a gondola. Even if you don't know much about Venice, you must know about the world famous gondolas. You'll find these along all the canals in Venice, although they are super expensive so we just watched them rather than riding one ourselves. This picture was taken on the riverside behind St Mark's Square. 2. Enjoy a beautiful view of the Grand Canal at Ca D'Oro. This is a famous palace in Venice, with a gallery, gardens, and my personal favourite: the beautiful arches giving a beautiful view of the Grand Canal. There is a small entry fee, but it's worth it just for this view. The arches are so ornate and beautiful and we stood here for some time just watching everything happening along the canal below us. 3. Visit the most beautiful bookshop in the world. I found about the Libreria Acqua Alta from my cousin who had visited Venice, and it was absolutely amazing. It's a massive bookshop with books piled high (as you can see!) in boats, bathtubs, gondolas - it really is quite a sight! It would be pretty difficult to actually find a book you wanted to buy, but it was very interesting to wander round, and this picture really doesn't do it justice. Just check out Pinterest to see what I mean! 4. Visit the famous Caffe Florian. 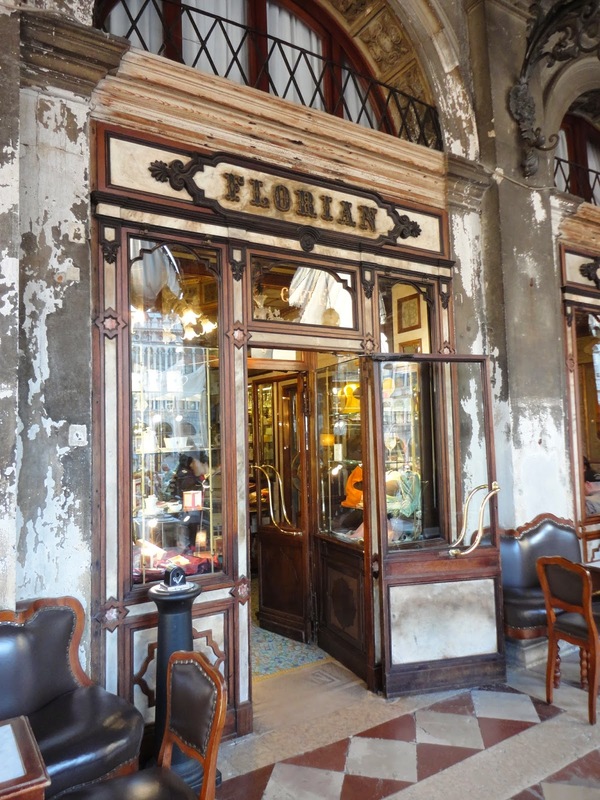 Another fairly obvious choice is to visit Caffe Florian in St Mark's Square. It is the most beautiful cafe I have ever seen, with detailed ceilings, floors and walls. It is super expensive - 15 euros for a coffee anyone?! - but definitely worth it to take in the atmosphere and it really is a once in a lifetime experience. Attention to detail here is amazing, everything is embossed with the Florian logo, and all served on silver trays. You can also buy macarons/cakes to take away. 5. Look out over San Giorgio clock tower at Venice. Another less obvious one now, is to get a water boat over to the small island of San Giorgio Maggiore and go up to the clock tower (don't worry - it's a lift up, no stairs!). The view from the top - as you can see - is incredible. We went around sunset and it really was a gorgeous view - if a little windy at the top! To the right of the image is St Mark's Square and it was amazing to watch over Venice from such a height. If you get the chance, definitely try it out! Have you ever been to Venice? If not, would you like to go? Hope you enjoyed this post!